Teaneck, NJ – As this election year moves towards a close, some of us may feel like we’ve had enough politics to choke a horse. Political satire is one viable option. Since the stone ages, whenever there is organized government, political satire is not far behind. 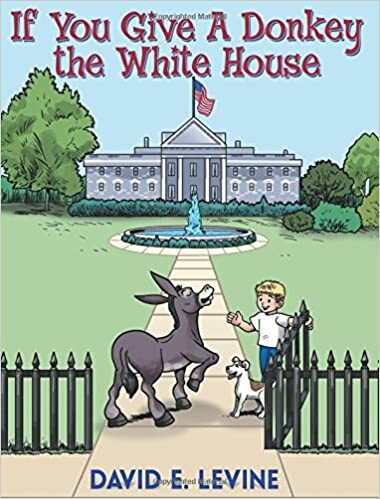 David E. Levine’s colorfully illustrated book, If You Give a Donkey the White House (Dog Ear Publishing), will have right-leaning readers in hysterics from beginning to end! What makes bashing bureaucracy so popular? If we went back to the oldest example of political satire around 400 BC and asked Aristophanes, there’s a very good chance that his answer would be the same today: It’s entertaining, and it’s a satisfying outlet that provides a good chuckle at the expense of government blunders. David Levine lives with his wife and four children in New Jersey, where he finds ample opportunity to make fun of donkeys.